Cape Town – With a simple hand salute and goodbye wave, a visibly emotional Riaan Cruywagen – after 37 years the longest continuing presence on South African television and TV news – signed off and said goodbye to millions of viewers on SABC2 at 19:00 during the Nuus om 7 on Monday evening. “My task is completed. Tonight, exactly 37 years after reading my first TV news bulletin, I’m retiring,” said the dapper newsman, dressed in a black pinstripe suit with a red-and-white striped tie and matching red hankerchief; his hair as perfectly coiffed as ever. “You know, TV news is a massive team effort, and I was just the ears of the hippo which stuck out. To you, the TV news viewers, thank you that you, over so many years, allowed me into your homes. For me it was an exceptional privilege and when I look back, it was all just grace. For the very last time, goodbye. Good day,” he said as he lifted his right hand and made a goodbye wave and hand salute to viewers. Riaan Cruywagen’s sign-off at the end of the bulletin was suddenly followed by an hour long retrospective TV special on SABC2 neither viewers nor shocked TV critics in the country knew about beforehand. 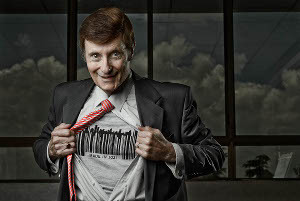 The special looked back at Riaan Cruywagen’s storied career as a news broadcaster and his stay at the SABC 2 which spans 47 years in total. At a farewell brunch in Sandton on Monday morning the SABC 2 presented Riaan Cruywagen with a special plaque. Jimi Matthews, the acting head of news and current affairs at the SABC said: “Now we’re going to have to get used to South African television news without Riaan Cruywagen. And it’s quite a strange notion; quite a strange feeling actually. Bessie Tugwana, SABC2 channel head, said: “For SABC2 I want to express our pride and profound gratitude that he has stayed this long. And not just staying long, he has brought professionalism to the news reading and some kind of believability.